Molding is tough, casting is even tougher. Trying to get a Space Marine shoulderpad correct is a lot tougher than I thought it would be. Not only do you have the whole mold making and casting process, your final work is set right on top of the model where everyone can see it. It's not like you're sculpting a boot or something that will be covered up for the most part. This is right out there for everyone to see in all its glory. For those following up from last week's post on making one piece molds and my epic fail, this post will touch on two piece molds or more like how I got my Black Dragon shoulderpad done. I'm sure it's not the best method by far, but it's my solution to the problem I've been faced with for quite some time now. It might help you with sculpting/molding/casting your own shoulderpads. 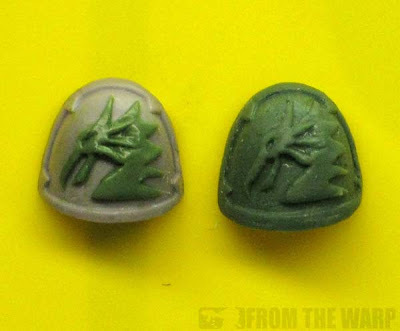 And to be a bit more accurate with what I'm doing here, I think this is best described as press molding with a two part mold. Let me add one small thing before we start. The purpose of figuring this out is so I can do this on a personal level. It's not to make enough money so I can retire next week. There's a ton of work involved in this and I don't know how practical it is for a whole army. Maybe a squad, but with a whole army, you get to the point where it might be a better use of your time to look for alternatives to this. When I left off my last post, it was with an epic failure. It was back to the drawing board and looking for a different technique. I wanted a shoulderpad with the Black Dragon icon on it, not glued on, not anything else... I wanted it to look like part of the shoulderpad. Since sculpting my icon on flat plastic wasn't going to work, I set about sculpting it directly onto a shoulderpad. 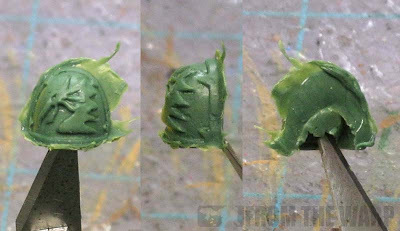 While it was curing, I tried a number of different ways to cast your standard space Marine shoulderpad. I decided I would try and cast the whole thing instead of just the icon. It might be easier and a little more solid in terms of construction. I took a practice shoulderpad and glued it down to a piece of plasticard. I knew I had to fill in the underside and the top portion. I also knew the two molds had to line up when put together. On top of that, I had to have a way for the excess greenstuff to be pushed out of my mold as well. No big deal, I've never done this before, but how hard could it be? I opted to glue it (the shoulderpad) down where it would be covered up by the torso and you wouldn't be able to see that edge very well once attached to the model. My first mold filled in the underside of the shoulderpad. On top of that, I created my second mold for the top surface of the shoulderpad. I made sure both molds overlapped and could be "set" into place exactly how I wanted them to so the underside and the topside lined up correctly. Once both molds cured, I separated everything and took out the practice pad. It was time to test my theory. I mixed up some greenstuff (this time going heavy on the yellow 70/30) and pressed it into my upper mold. Making sure I had enough to fill all the voids, I took my lower mold and pressed the two molds together until they "locked" into place. Now the agonizing waiting game began. When I could wait no longer, I cracked open my molds and carefully peeled out my experiment. I was quite happy with what I found. After trimming away the excess from the back of the shoulderpad, I knew I had a process that just might work. The detail is there, it's "on" the shoulderpad as opposed to being glued on afterwards and it looks like it will work. After cutting away the excess greenstuff, I realized I don't want to go heavy on the yellow for flexibility... I want to go heavy on the blue for stability. At least my normal 50/50 mix for sure. Armed with my vast experience in mold making and casting, it was time to put it all to the test. My custom made shoulderpad had cured enough to cast. I mixed up my Blu-Stuff and made both halves of my mold. Once I cracked it open and was comfortable I had a decent set of molds, I mixed up some greenstuff. I realize now that my bottom mold did not fill under the shoulderpad completely and I'd have to cut some of it out so the arm would fit correctly. No big deal as long as the top mold turns out well. With the extra greenstuff, I made some fixes to the model I had waiting. 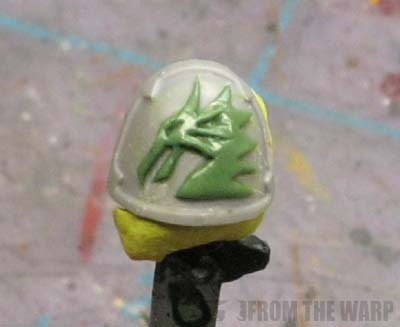 That's right, I built a Black Dragon Space Marine just for this shoulderpad. 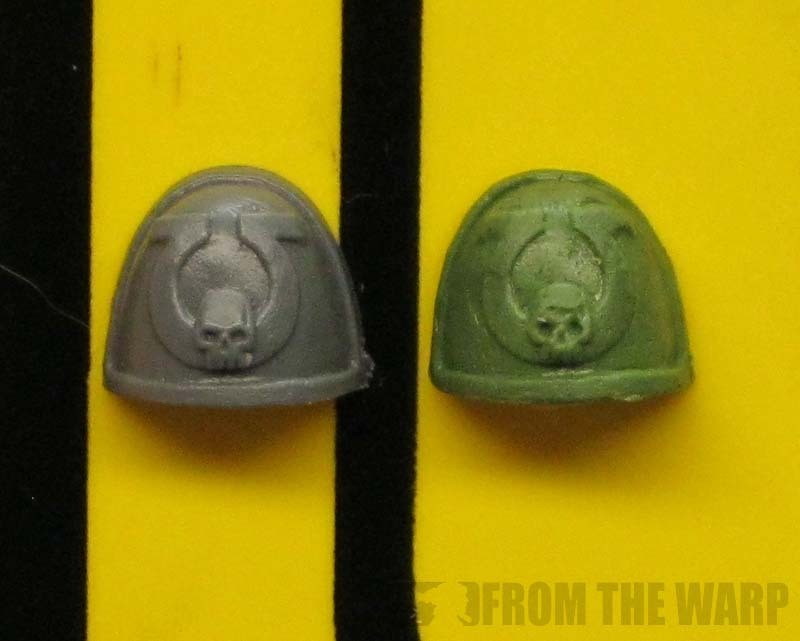 When I was confident the greenstuff had cured for long enough, I set about breaking open my molds to see the results. Flashing was minimal to my surprise. I'd expected much more, but I guess I was fortunate in my casting this time. The inside of the shoulderpad needed a bit of work to get it to set properly on the arm. All in all, I'm very happy with the results. Is it going to change the world for me? Not likely. I've got a way to make multiple custom shoulderpads now without having to sculpt each individual pad. I don't see this replacing all of my shoulderpad needs. It's far easier to buy the ones I need when possible and save myself the headache of doing it like this. It's been glued onto my model. Here's the completed model with custom shoulderpads and all. Fantastic tips Ron, Iv been trying to use Instant Mold and having issues. I will have to try this out and see if I can reproduce my Dragon warrior shoulder pad. Wow, looks great! I'm interested to see how the painting turns out. This would be great for making a whole squad with special shoulder pads. Press molding can be tough on anything that isn't flat. 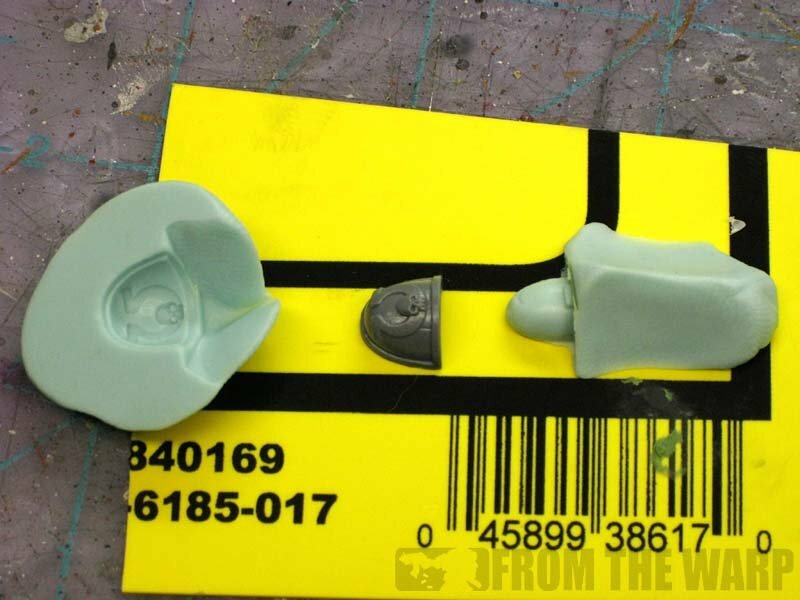 You may want to consider a resin casting kit, where the mold is poured. You may not use it for entire armies... but I might be crazy enough to! Beyond which, you've seriously sold me on Blu-Stuff now with just how extensive you've used it for this process alone! Now to order some. I've done some amateur resin molds and cast them... my biggest hurdle there is always air bubbles. Considering I don't want to invest in a vacuum chamber right now, it's a bit of a hurdle. I have had luck eliminating the vast majority of air bubbles by just refining the process and being more patient... as well as placing the molds on a cheap back massager pad and setting the vibrations to low. that helps float the bubbles to the surface. The Pirate Viking: Well enough that I'm comfortable using it for a squad of marines if need be. It's a steep learning curve, but not impossible to do as you can see. And I have zero experience with this kind of thing. Charles: Like I said, I went with this because it's the first stuff I got my hands on. I'm not sure I need to go elsewhere now that I can get the results I want. Fayte: Next week my friend. Next week I'll post my painted model. Tom: I'm not there yet. Greenstuff press molds allow me to do the small things without any other equipment or worries at this point. I may get to resin though... we'll see. Tim Toolen: If you have some experience already, then you may be able to do even more with Blu-Stuff. I'd say that for anyone comfortable working with greenstuff, adding Blu-Stuff to your workbench tools will only expand what you can do with GS. It's not the only thing out there, but it's something you can use to expand your greenstuff abilities with. Looks like I won't be needing to do a two part mold tutorial after all. You've done a great job with this, I never really considered doing shoulder pads in two part molds before, but it works a treat. Lamenter: I learned tons from trying to do this. I'm fortunate that I have the resources (time, tools and such) that I can keep up with what I want to try so my learning can move quickly. If I were to do it again, I would make sure to do a few things different. I'm debating making custom shoulderpads for my Deathwing army when it comes time. I've only just started trying to sculpt into greenstuff, but one of the nagging thoughts in the back of my head was "How am I going to reproduce this en masse?". I might just have to get some of that blu-stuff just to play with. It looks like one of your molds broke in half? That concerns me a little about this product especially considering that you need flexibility to be able to make a good pressing. I think the flexibility and infinite re-usability makes Instant Mold a slightly better choice. Ant: It will certainly open up more options once you get a handle on working with greenstuff. War Frog: That's not from use. I deliberately tore it apart to see just how tough it would be to do. I was trying to get an idea for how flexible the material is based off of how thick. The more thick, the more sturdy. If you keep it slightly thinner, you get increased flexibility in your mold. The twin sirens of resin and silicone call to you, Ron. They sing the song of convenient custom bits and perfect casts. Myles: They do... they do. I'm strong right now, but I suspect if I were to get something for Christmas, it might be something along those lines. Hi Ron, I would suggest finding a plastics/polymers supply company and investing in some RTV silicone and a simple two part poly-urethane resin. To attempt production on a limited scale, you will need a small air compressor, a decent vacuum pump, and small pressure paint tank to make bubbles a non-issue. Two things, first use the vacuum to attempt to evac as much of the air first and then switch to pressure and crush the bubbles down. This has to happen quicker with curing resin than with curing silicone, but you get the idea. 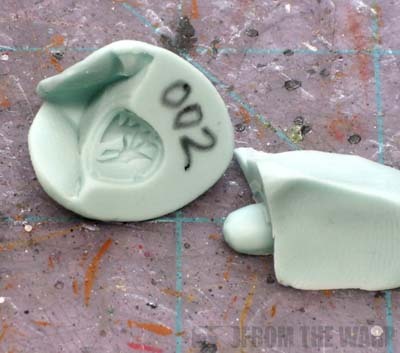 My advice with silicone is to attempt two part molds with a simple pottery clay as the parting line for the halves. 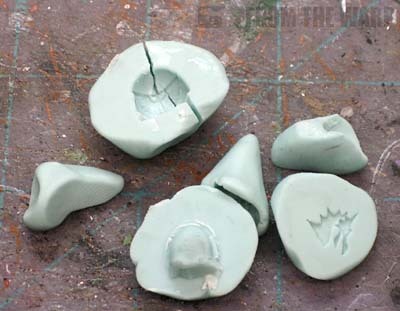 Sculpt your master into the clay, minding air movement when you pour it for resin, and also leave room for resin 'wells' in the points you will pour resin into the mold later (trustme). After the RTV cures, tear the bottom of the mold off and carefully peel the clay out. Mind all your pour points and wells. Spray with a release agent lightly and pour up the other side. Build tall walls with cardboard or newspaper, as the vacuum will boil over the silicone as the air escapes, like rising bread, expect 3X volume. With the resin, you have to be pretty fast, depending on your cure time. This is where your 'wells' come in handy to carry extra resin while the air evacs and then is crushed. There has to be extra resin to supply the lost volume. This is the best way I have found so far on limited production runs, because I personally feel the hobby is too expensive for players like me that regularly expect to play games like 'Apocalypse' theme. When we play, we put it on the board and play with it. The model is armed with what it has and thats it. So, anytime you need an artillery strike from 32 Adeptus Mechanicus Earthshakers mounted on platforms towed by trojans and protected by hydra and manticore batteries, you can have it!!!! Anon: Thanks for the tips. I'm looking to get started with some resin in the coming months once I get a little more info. I have been following your blog for a while and now I am trying to use the same technique for the shoulderpads. I just have a question. 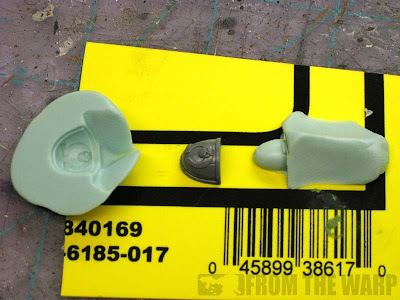 How do you do the molds exactly? Do you first do a mold for the inside of the shoulder pad (where the arm belongs) and then wait till it hardens. After that you do a second mold for the surface? 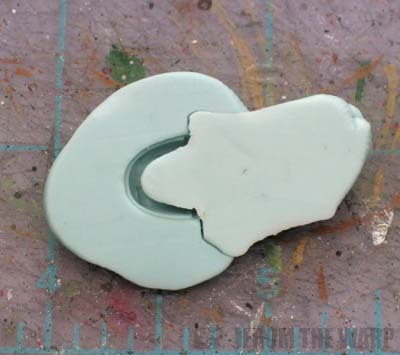 Or do you do a complete mold and then just make a cut to separate both pieces? Could you explain that part a little bit more in detail?